Alumni are a critical component of the IGL, connecting the past to the present and offering opportunities for future generations. 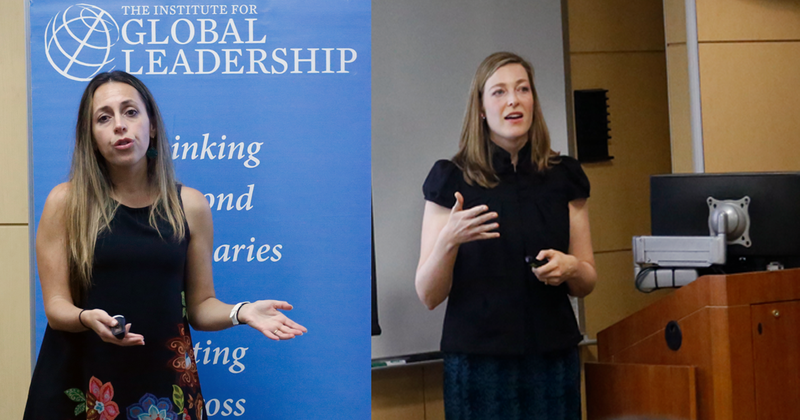 The IGL is engaging alumni in new and imaginative ways, including public speaking on campus, advising students and recent graduates, alumni gatherings throughout the country, and providing internships. Over the past year, the IGL has held two alumni panels, and is planning for a third on November 15. The alumni panels give students a sense of the current positions that alumni have as well as the path they took to get there. Last November, Brad Bernstein (EPIIC’89, A’89), Anne O’Loughlin Bosman (EPIIC’02, A’02), and Stephen Gershman (EPIIC’09, A’11) talked about their careers in business, covering investment, financial services, strategic partnerships, consulting and social entrepreneurship. This September, Anna Winderbaum (EPIIC'90, A'90) led a roundtable discussion on private banking and wealth investment. In October, Tamy Guberek (EPIIC’99, A’02) and Kristen Cibelli Hibben (EPIIC’99, A’99) spoke on the impact that their joint research project on understanding the local impact of the International Criminal Tribunal for Yugoslavia had on launching their current careers. Tamy is a Ph.D. candidate at the University of Michigan School of Information, and prior to that worked at the Human Rights Data Analysis Group. Kristen holds a Ph.D. in survey methodology from the University of Michigan and currently works in the International Unit at the Survey Research Center at the University. On November 15, the IGL will be hosting Michael Niconchuk (BUILD, A’11) and Elizabeth (Biz) Herman (EPIIC’08, Exposure, A’10) on “Mind, Body, Schisms: Conflict and Cognitive Science”. Mike is the Senior Researcher at Beyond Conflict's Innovation Lab for Neuroscience and Social Conflict in Boston. The Innovation Lab generates and uses new insights from brain and behavioral sciences to improve conflict mitigation and resolution programming. Biz is a Ph.D. Candidate in Political Science at University of California, Berkeley, and since 2016, has been an Innovation Fellow at Beyond Conflict’s Innovation Lab. Mike also came to Tufts in the spring, along with fellow BUILD alumni Katherine Taylor Reddy (BUILD, A’11) and Nithyaa Venkataramani (BUILD, EPIIC’13, A’13), to advise the current students in Tufts International Development (formerly BUILD) on their projects and fund raising. Mauricio Artinano (EPIIC’04, Central American Peace Project, A’06) spent an afternoon with students sharing his experiences with the United Nations and his work in Colombia and Somalia. Alumni have also come back to speak in the EPIIC class and have been the guest lecturers at the last two EPIIC Immersion Weekends. Since Abi Williams began as the new director of the Institute for Global Leadership in July 2017, he has been reaching out to alumni in the U.S., Berlin, and London. He has met alumni in Chicago; Washington, DC; Philadelphia; New York (graciously hosted by Neil Blumenthal (EPIIC’02, A’02); Aspen (graciously hosted by Jared Goldberg (EPIIC’90, A’91); Boston (graciously hosted by David Chang (TILIP’02, A’02); Denver; Los Angeles; and San Francisco. These events are always enriched by the enthusiasm and dedication of IGL alumni. He has also been asked to speak at Tufts Alumni events from Philadelphia to Denver to Berlin, where he spoke at the Tufts Global Reach and was introduced by Jessie Berlin (EPIIC’05, A’08). He has also met with a broad range of alumni individually and looks forward to meeting many more in the coming months and years. Some alumni have taken advantage of the opportunity finding their interns among current IGL students, and we would like to encourage more to consider this opportunity. We would like to invite all alumni to get more involved with the IGL!